Brock Lesnar now has six professional fights under his championship belt. Following his dramatic 2ndRound submission victory over Shane Carwin at UFC 116, it appears the 32-year-old is only getting started. You hear that, Fedor Emelianenko. “He’s tougher than we thought he was. He’s definitely tougher than we thought he was,” UFC president Dana White told MMAFighting.com. “The guy continues to grow as a mixed martial artist. He doesn’t have the greatest stand up you’ll ever see. He pulled off his first submission tonight. Actually, he subbed Min Soo Kim with strikes in his MMA debut, but Dana’s point was made nonetheless. 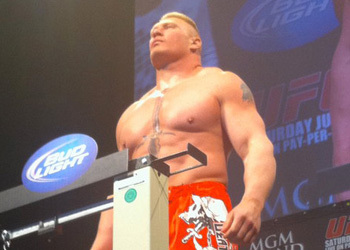 Although, it was Lesnar’s emphatic statement inside the cage on Saturday night that has everyone buzzing. Since being humbled by Frank Mir in his first Octagon outing, the former WWE superstar has morphed into the planet’s most dominant heavyweight today. You still reading, Fedor? It was nearly a perfect evening for the controversial wrestler. He proved his mettle by surviving an early onslaught, used his striking to set up a Division I-level take down and showcased his crafty Brazilian jiu jitsu game to unify the UFC crown. Lesnar’s performance, parlayed with Fedor’s abrupt fall from “The Land of the Untouchables,” should certainly have Lesnar sitting atop the 265-pound throne all alone, right Dana? “Regardless of what happened last week [at “Strikeforce: Fedor vs. Werdum“], this fight was going to determine who the world’s best heavyweight is,” White matter-of-factly said.